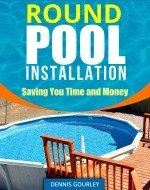 Hello, we are installing an 18x34 Doughboy Sapphire pool. One end of the pool will sit 20 inches below grade. We need advice on exactly how to safely backfill the area and protect the pool walls from corrosion. I've attached a pic. Also, you'll see how rocky our soil is, this is a concern, especially in the deep end. We will remove them and pack dirt as needed, but how many inches of sand would you recommend? We currently have enough sand for a 2 inch coat, but we're thinking we'll need more. Hi Julie, I work in the Arizona desert, that looks like pretty normal soil to me. Keep working it, as the big rocks come out replace them with soil. Water and tamp the final grade and check once again for any rocks. After that your two inches of sand will be just fine. The more sand you use the more chance you have for footprints. 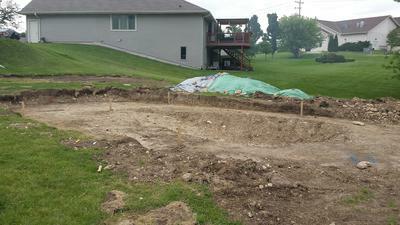 You have so much more digging and dirt moving to do, just keep moving the rocks out of the pool area. I do see a potential problem in the photo you posted. You started digging the hole before setting the braces and end rails. When I do a deep end on an oval pool I always set the braces and end rails before I start digging, that way I dig the hole to fit the pool, instead of trying to fit the pool around a hole. That and it prevents any over digging, which is where it looks like you might be headed. Maybe not, photos can be deceiving at times. Some of my customers would try and save some money and dig the deep end themselves, and 9 out of 10 times the hole was too big. This especially happens with Doughboy ovals. The steel channels extend into the pool a long way, past that you need another 6" of pool grade before you start your slope. Just a suggestion, you may want to start unpacking boxes and get a pool frame to work off of. What about the back fill? Hi Julie, I would just use dirt against the wall with plenty of slope to drain the water away from the pool. Some people like to coat the wall with roofing tar before the backfill. That's OK but not really necessary. I am in almost the same situation you were. One section of my pool is about 2 1/2 feet below grade. Did you end up coating with roofing tar? Also, what do you plan on doing when it is time to replace the liner? I am on the fence with using slurry as back fill but I am worried if I don't that I'll have a wall collapse when the liner needs to be replaced.